I understand your point about approachability--it's so important for librarians not to appear to be standoffish or aloof from the students they should be helping. However, I think that any instructor can communicate friendliness, competence, and approachability best by being humorous and enthusiastic. Students can be very harsh judges of perceived incompetence. Certainly one should acknowledge making a mistake or not knowing the answer to a question, but I believe that one should model expertise and not undercut oneself with intentional errors, however well-meaning. That said, if you encourage students to identify or correct your mistakes as part of their learning process, then that's a fine teaching tool. Spelling errors and typos don't make me seem incompetent. Also, I tend to say things like, "Okay, I've not tried this particular search in this database, but let's try it together," I don't sound incompetent - I sound like I'm modeling the learning process. 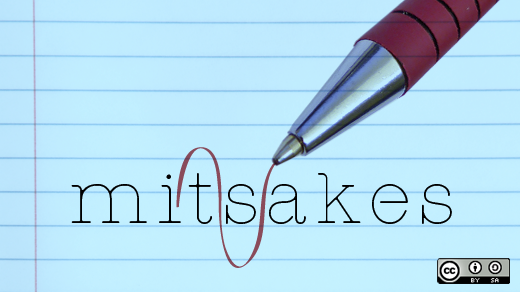 When I first started teaching infolit classes, I was dead scared to make mistakes. Since I was young, not much older than many of the students, I felt it was imperative that I didn't slip up, because I'd lose credibility. Fast forward six years and I've relaxed a whole lot. The occasional mistake or database glitch happens and I've learned to cover it with humour and letting them see how to retrace their steps and pick up their search. In short, I've learned I'm human, not a robot and mistakes will be made. If I don't sweat them, the students usually don't either. Although I don't teach workshops or classes, I am a previous school teacher and current Library Assistant who helps students with their basic info search queries. In both of these positions, I have noticed that students (both younger and older) relax and appear more engaged when they realise the person at the front of the class/behind the lending desk is human and makes mistakes just like they do. As you state above, the important part of this whole experience is how you model the next steps in correcting the mistake. It is definitely something that is hard to overcome at first (I'm a perfectionist - agh! ), but now I enjoy sharing a giggle over my spelling 'mind-blanks', and I love it when the students have an 'ah-ha!' moment when I'm working through my errors.